We're taking our second excursion into enterprise-class desktop territory with the kind of machine that should be of interest both to IT management and enthusiasts alike: HP's Z210 SFF (small form factor) workstation. 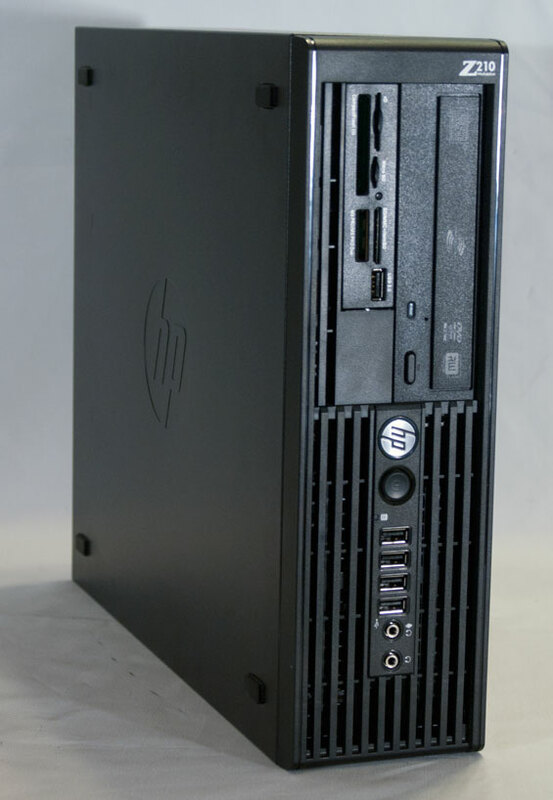 Desktop computers are capable of getting smaller and smaller these days, and with the Z210 SFF, HP is hoping to make serious number crunching power available in even the tightest of spaces. It's always interesting to see just how much performance can be crammed into a tiny computer, but did HP have to make any sacrifices to hit this target? I'll readily admit I'm a huge geek when it comes to smaller computers like this one, so whether it was enterprise class or not, the Z210 SFF was going to be something I'd want to get my hands on personally. Thankfully, it fits right in with our hopefully expanding coverage of enterprise-class towers. We're still working out kinks in our testing of workstations, so suggestions on how to improve it are always welcome. The last time we reviewed a desktop workstation was our Dell Precision T1600; as you'll see there were some changes made here. Unfortunately, at time of publication HP didn't have a page up for custom configuring the Z210 SFF; the top-of-the-line model they list is basically identical to our review unit, but with the NVIDIA Quadro 600 workstation graphics card added. Keep in mind that's the most powerful workstation card HP offers with the Z210, and it retails for $169. Given vendors' proclivity towards adding a premium to upgrades, I'd expect the end price for this kit to be around $2,000. So what do you get for your money? For starters, HP equips the Z210 SFF with an Intel Xeon as opposed to a consumer-grade Core i3/i5/i7, in this case the E3-1245. The E3-1245 is roughly equivalent to a Core i5-2500 with the additions of Hyper-Threading, Intel HD Graphics 3000, and 2MB more L3 cache; it runs at a nominal 3.3GHz and is capable of turbo-ing up to 3.7GHz on a single core (losing 100MHz for each additional active core under turbo), sports 8MB of L3 cache, and maintains a 95W TDP. Connected to the integrated memory controller are four 2GB Hynix DDR3-1333 DIMMS with ECC. Pulling graphics duties is a half-height NVIDIA Quadro 600 workstation card, and we have some surprises for you when we get to the workstation benchmarks. The Quadro 600 is the enterprise-class version of the GF108 chip that powers the desktop GeForce GT 430, featuring 96 of NVIDIA's CUDA cores with 1GB of DDR3 strapped to a 128-bit memory bus. Clock speeds are a bit underwhelming, though; the GT 430 ships at 700MHz on the core and 1400MHz on the shaders, against the Quadro 600's 640MHz core clock and corresponding 1280MHz shader clock. The DDR3 runs at an effective 1.6GHz. Still, remember that this is a workstation card and benefits from NVIDIA's Quadro drivers. The rest of the system is relatively tame and unsurprising for a workstation, but HP does add both a USB 3.0 expansion card and an Intel X25-M 160GB SSD based on 34nm NAND. In our admittedly anecdotal experience, Intel's SSDs tend to be extremely popular in the enterprise sector; outside of the current issue with the 320 series SSDs, Intel drives have typically demonstrated the lowest failure rates on the market. So for those of you wondering why we're not seeing high performance SandForce-based SSDs or SATA-III kit, there's your answer. I builded a minitower PC back in december 2010 and it happens to include a 2600K and a Nvidia Q600 + 8 MBs of memory and W764. It is a great system and it was about $1500 from Newegg, Amazon and a local CompuUSA. So it is a mixed commercial PC with an entry Quadro to run 3D apps, mostly Maya 2011, but I run 3D terrain modelers, Photoshop or gaming engines with an Nvidia 460 installed on another slot (both cards at the same time). It runs very well and stable, I haven't overclocked the CPU but is really fast. For comparison it renders one image using Maya software or Mental Ray as fast as my Mac Pro 2008 with 8 Xeon cores at 2.8 MHz. But at some other rendering jobs as toonshading the 2600K doubles the Mac Pro performance (because the memory subsystem in the newer i7). However the Mac Pro is the machine I run all day and night and it is as stable as it possibly can be, it never fails and it runs cool and silent. But for 2K the HP including a Xeon is very competitive. Also the size (not the shape) is appealing to me. I need a Mac for FCP and because I have a ton of images, references, fonts, software, devices connected I like OSX and I am proficient using the Mac. I will upgrade the MP at the end of this year. I am thinking to try the top iMac that includes the 2600K, but I am afraid the iMac wont be able to handle all the demanding job the Mac Pro does or it may not be as easy to upgrade, handle everything, exchange HDs. etc The Mac Pro is a very solid workstation based on Xeon technology. An experience I can share is the BIG difference a Quadro makes in Pro 3D, it is not only the performance numbers you can digest. I tested the 460 alone and it is a horrible card for that. The Q600 produce an image in the viewport the 460 can't touch. I am glad I have both machines to run what I need at critical times and now I will always have both the Mac and PC combination. It gives me literally 2 eyes to try many things and I do. It hasn't yet! because I did not "upgraded" immediately (clever me) but it was shocking to know Apple's new strategy and in general the massive complains it generated and why. Being an early adopter has been hard on me lately on both Mac (Software and hardware) and PC (hardware). I guess I will investigate in detail how the new FCPX will affect me and when I feel confident I will upgrade. As for Premier Pro I guess I will download the trial and see how it works before the upgrade to FCPX. Well what you would need is a video card with HDMI audio support. While one Anandtech reviewer recently referred to HP as a slow moving company, compared with Lenovo, as stated in this article, they do come up with enterprise hardware using the latest technology fairly quickly. In our organization we migrated to Windows Vista about 3 years ago and are about to move to Windows 7 next year. The hardware we received at the time was reasonable but already more than a year old in terms of when the chip hardware was released by Intel. I have a Lenovo S10 workstation that takes 90-120 seconds to boot up when you factor in all the corporate crap and is not noticeably faster than their standard desktop. They are proposing to replace this NEXT YEAR with the "BRAND NEW" S20 which can be found in reviews dating back to August 2009 (PCMag). Thanks for the article (haven't read it all, yet), but I wanted to ask you if you can also post the measurements of the case in the metric system (mm or cm) for your international viewers. Anandtech sometimes has both, sometimes just the metric one and sometimes just the imperial one. Thanks for the article! Tho I like to build my own gaming pc for home, at work we're considering workstations like this because of service, warranty, etc. I'm stunned by the OpenGL performance of the Quadro 600 card, didn't think there was such a gap compared to GTX580-class GFX. CS5 benchmarks are all well and good, but I would reckon if you're in the market for one of these then you're in either engineering (ie, CAD or similar) or development, and the benchmarks covered neither.